There are a few things that all of us Byrdie editors definitely have in common: We are meticulous about ingredients, have a unquenchable fascination with global beauty, and are total suckers for chic packaging. But interestingly, among our beauty routines, not much else is the same. Thanks to our access to some of the savviest experts in the industry, we know how personal a person's skincare regimen is. Every philosophy we've been exposed to—from Ayurveda to Western dermatology—agrees that with so many skin types, tones, and sensitivities, everyone's products and habits must necessarily be different. Which is why when the Byrdie team sat down to chat last week about our absolute favorite skincare picks of the moment, we couldn't think of anything we all loved… except for one totally random product: a $19 balm that our news editor uses as a makeup remover, our social media editor uses as an eczema treatment, and I've used to heal an infected ear piercing. What is this versatile skincare gem? One Love Organics' mini Multi-Tasking Wonder Balm. Keep scrolling to learn more about the miracle-working balm that everyone at Byrdie is obsessed with. Lots of skincare products on the market claim to be multitasking—"You can use it as a moisturizer and a skin salve! "—but in practice, they're really only good for one thing. The particular blend of natural oils and plant extracts in this balm, however, makes it truly transformative and compatible with different skin types (organic coconut oil, mango butter, jojoba, and chia are just a few of the yummy items on its 100% pronounceable ingredient list). "This is one of the most versatile products in my routine," says our news editor Victoria Hoff, who removes her makeup with the product nightly but also uses it as a treatment for inflamed skin and cuticles. 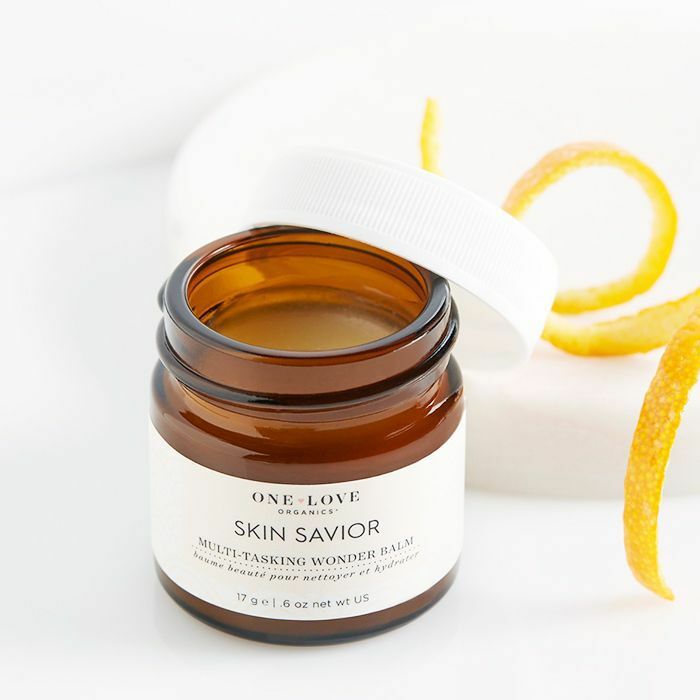 Our social media editor Aimee Jefferson swears by Skin Savior as the ultimate dry skin and eczema remedy: "Usually, I rely on face oils to give my skin extreme hydration without clogging my pores, but I make an exception for One Love Organics Skin Savior," she says. "It leaves my skin feeling moist and dewy without my pores feeling clogged. It really is the perfect moisturizer." As for me? I use the product on my super-dry under-eyes, cracked lips, itchy eczema… I've even used it to treat an infected piercing, as coconut oil is antibacterial. Better yet, the tiniest amount of product goes such a long way that even the travel size can last you months. Plus, the balm smells incredible. Take it from our resident fragrance guru Victoria: "I normally despise fruity/floral scents, but the tropical aroma is downright addictive." See for yourself why everyone in the Byrdie office is smitten with this stuff by picking up a mini tub below! "This is one of the most versatile products in my routine." What's your favorite (affordable) skincare multitasker? Tell us in the comments below!